I got a Japanese waterstone for christmas. I’ve wanted for some time to learn how to sharpen an edge properly on a stone, rather than with one of those little sharpening jig things. There’s an old oilstone sitting in the basement somewhere but it always clogs extremely fast…from what I’ve heard, waterstones are generally faster and cleaner and fairly straightforward to use. I soaked the stone for half an hour to get it properly loaded, and watched a couple of videos online to get the idea of the proper technique. With time you apparently develop a sense for how the blade is sliding on the stone and the sounds it makes to know if you’re working it properly, but at this point I’m only really able to tell by feeling the edge and trying to guess whether it got sharper or duller. So I sharpened a whole bunch of knives, starting off with some of the cheap old ones sitting in my toolbox to get the idea. Getting the angle right is critical, of course, and the required pressure was more than I expected. I think I did a decent job: I turned a completely dull and rusted knife that I found on the road into something that’ll cut a tomato, got my pocketknife sharp enough to slice paper like an X-Acto blade at the tip, and honed a Japanese carpenter’s knife into an edge sharp enough to shave with. Seriously. It’s pretty clear from that how the different grinds and steels affect the sharpness of the blade — the Japanese knife has the shallowest grind and is made of very hard, very brittle high-carbon steel, while the Found Object knife has a pretty steep grind and the blade is flexible, so it’s probably mild steel or something equally cheap. Of course that does mean that the Japanese knife is fragile, while the Found Object stands up to much more abuse. Always a tradeoff. My sister says I look like a sociopath sitting at the kitchen table slowly sharpening a pile of knives one by one. But any boy scout can tell you that a sharp blade is safer than a dull one…and besides, who doesn’t like having nice tools? 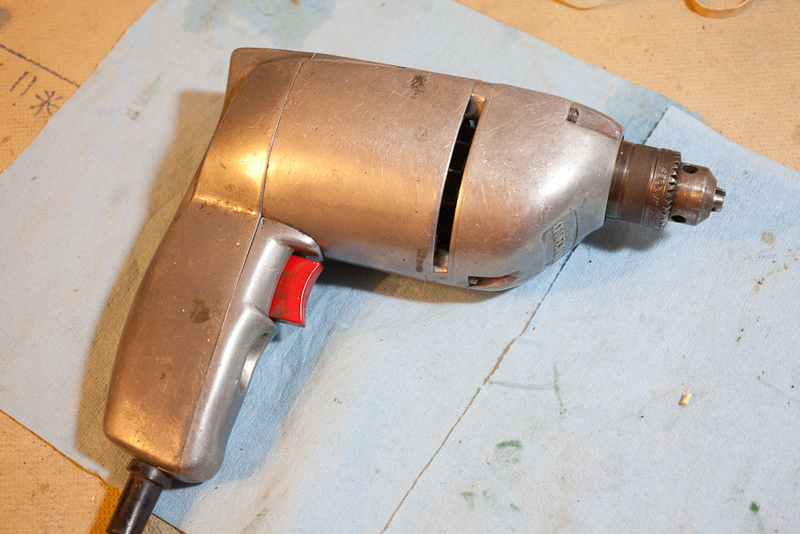 I got the aforementioned power drill with great bearings all cleaned up and working beautifully again! I decided to make a separate page about it, though, so you can find that over here. Suffice it to say this is one heck of a piece of machinery, and a design lesson to boot. I’m repairing a power drill (more on that later), and I found inside it a rather excellent ball bearing. * Why is “ball bearing” a synonym for “steel ball”? A ball bearing is a bearing, i.e. a rotary fitting that supports a spinning shaft, that uses balls to reduce contact area. It isn’t a marble made of steel. I’m guilty of calling the balls “ball bearings”, but the more I think about it the more I wonder why we needed a more obscure and less accurate metonym for “steel ball”. Guess what I found at the flea market today! It’s heavy — 15 to 20 pounds. It’s clearly made entirely of cast steel or brass, painted with a pebbled black anti-reflection finish. It’s beat all to hell and has a military ID plate on it. It is a Fairchild K-20 Aerial Reconnaissance Camera. And it cost 30 dollars! Awesome. This is certainly one of the strangest cameras I own. It has a fixed focal length and only three shutter speeds, but a steplessly variable aperture. The shutter release is a pistol trigger on the right handgrip. The flip-up viewfinder is an enormous glass lens with a crosshair inscribed on it and bent wire with a ball on the end sticking out in front — you align the ball with the crosshair and you know you’re on-axis. Incidentally, this is exactly how aircraft gunsights worked before the reflector sight was invented. From what I understand of the history, these cameras were most commonly used in B-17s and B-24s in the Second World War to assess bomb damage on the ground. Someone would basically just hang out the window (or look down through the bombardier’s pit) with the camera around their neck and snap photos of the destruction for later analysis. Given where I found it, it’s more likely that this was used in training, but It’s possible that someone could have taken it up in a CF-101 or similar.